Autism and the Art of Communication: What is Autism Anyway? Ever heard the Indian fable of the blind men and the elephant? 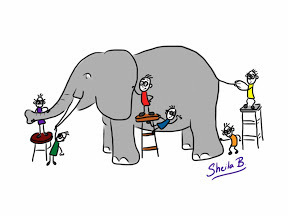 A king asks a group of blind scholars to tell him what an elephant is like. Each defines the elephant based on his limited contact with the animal - the one at the tail describes the elephant as a rope, the one at the leg says "no, it's like a pillar", the one at the belly argues that clearly an elephant is like a wall, the one at the ear says "it's like a fan! ", the one at the tusk thinks an elephant is just like a sword, and the one at the trunk would stake his life on the fact that an elephant is the same as a tree branch. In some versions of the story a big melee follows with each scholar willing to fight to the death to defend their learned viewpoint. The field of autism is plagued with arguments over definitions, diagnosis, treatment and philosophy - and for the most part, this has not been helpful to ASD individuals and their families. The constant conflict causes discussions to go around in circles, as each faction searches for an elusive all-encompassing theory that explains "autism". But what if the blind men listened to each other? In some versions of the story, this happens. What if we recognized that different perceptions and perspectives could illuminate pieces of a larger truth? One that could only be understood by looking at all of the information, all together, without bias and preconceptions? What if we stopped arguing and started listening? My practice is unusual, in that I work with individuals over a long stretch of time. The 2-yr-old that comes through my door stays with me through preschool, elementary school, high school and beyond. This has challenged all of my original "learned" viewpoints and changed my view of what autism is. I'm not sure that a single one of my preconceptions about the diagnosis has survived. In my practice I bring the best that I have to each person that I see, and therapy never looks exactly the same for any two of them - I match the intervention to the individual. Some are very verbal (note: the first time language "suddenly" appeared in one of my clients, I thought my therapy and I had caused it; the next time it happened, I realized that some individuals are just "set" to do this language burst), some are moderately verbal and some are very low verbal. The difference in outcomes reflects differences in the individuals from the start - no "one size fits all" treatment or developmental path. What am I left with in terms of answers? One thing. The question is wrong. The question "What is autism?" and the related question "What is the one definitive standard treatment for autism that will result in a 'successful' outcome for all?" are misguided and misleading. Autism is not just one thing. Defining autism as a "spectrum" is a good start, but the next step is realizing that members of that spectrum are the most "individual" of individuals, and that one approach, one definition, one philosophy or theory is never going to define, treat or educate them all. Real life and real people are messier (and more interesting) than neat diagnostic boxes. Maybe if we all recognize our own blindness, the limitations of our knowledge and the complexity of the question, we could work together and do better for the people we are seeking to help.